The 1987 share market crash is referred to as 'Black Monday 19 October 1987'. For investors in Australia, it was actually 'Black Tuesday'. We awoke on Tuesday morning to the news that Wall Street had plunged 508 points...a 22% fall in one session. The chart shows us the Dow actually peaked in July 1987 at 2750 points. Over the course of the next couple of months, the Dow gradually drifted lower...until 19 October. That's how quickly things can happen. 'Black Tuesday' was a baptism of fire for my fledgling financial planning career. …it's perhaps the most important work we have published ever, yet. I strongly urge you to download it…and read it right away. After all, it has the potential to dramatically change your life…for the better. At the Summit, Senior Analyst and Co-head of Research, Tanushree Banerjee, will reveal full details about Rebirth of India… including specific opportunities to profit from it. The phones ran hot in the office. Panicked investors were looking for solace. Would markets rebound and make their dollar whole again? When it became obvious that recovery was not going to happen any time soon, the redemption requests came in. Investors exited the market after it had fallen...not before. The same 'panic after the crash' mindset was there in the 2000 dotcom bust and 2008 market rout. Prior to the collapse, people think they're going to smarter than everyone else and hold, hold, hold until the very peak and then sell before the proverbial hits the fan. Sorry, that's not how it works in real life. Markets have a way of springing nasty surprises. The only way you avoid a panicked exit, is to leave well before the sudden collapse. Yes, you'll miss out on some gains...but as they say, 'better to be a year or two early than a day late'. Thinking you're smarter than the market is one of the dumbest mistakes people can make with their money. Investors in Hong Kong have just learned how quickly capital can be vapourised with a mood change. 'A string of Hong Kong-listed stocks plunged without warning in afternoon trading, the latest shock losses to sideswipe investors in the world's fourth-largest equity market. 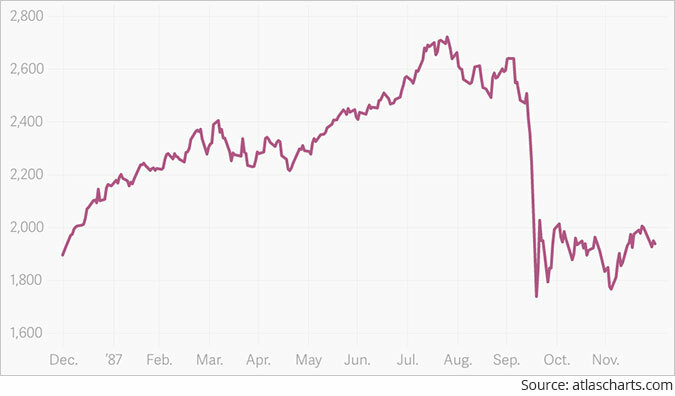 The share price chart on Jiayuan International Group Ltd. tells the sad story for investors. One day your sitting on a stock worth HK$14...and the next it's closer to HK$2. Why the sudden reversal in fortune for these stocks? '"There is worry that they will not be able to repay the bonds, which triggered fears over default," said Louis Wong Wai-kit, director of Phillip Capital Management. Please read and re-read that last sentence. This principle applies to any company that's borrowed money from yield starved investors in recent years...especially those US corporates - rated one notch above 'junk' status - that have issued trillions of dollars in corporate bonds. If the company is unable to meet its debt obligations...then shareholders can look forward to a sudden collapse in value. '"The market is worried about the liquidity situation among mainland Chinese property stocks," said Kenny Tang Sing-hing, chief executive of China Hong Kong Capital Asset Management. The story of boom and bust never changes...just the actors. In 1987, it was the new breed of entrepreneurs who'd taken on too much debt. Everything is good until it's not. China, the global growth engine of the past decade, is slowing...under the weight of debt, trade war and that other indisputable force...trees do not grow to the sky. 'Nidec, a Japanese company with $14 billion in revenues last year, makes a wide range of electric motors, from tiny devices that make the iPhone vibrate to industrial motors. It's the world's largest manufacturer of motors for disk drives. For the automotive industry, it makes things like engine and transmission oil pumps, coolant pumps, control valves, and fans and blowers. It makes motors for industrial robots, etc. It's a supplier to Apple, other electronics makers such as hard-drive makers, but also appliance makers, automakers, robotics manufacturers, industrial equipment manufacturers, etc. In other words, the company is a key supplier of advanced parts to Chinese factories. 'Taiwan Semiconductor Manufacturing Co. [TSMC], the world's biggest contract chipmaker and sole supplier of iPhone core processor chips, and Japan's Nidec, sole supplier of the motor that makes iPhones vibrate when receiving calls or texts, are the latest to deliver downbeat assessments for 2019. TSMC expects a 22% drop in revenue for January to March, while Nidec has cut its full-year profit outlook by more than 25%. That's how quickly things can change...confidence is a fickle thing. But Nidec and TSMC are not isolated cases. 'German industrial giant Kuka is the world's largest producer of robots used to make automobiles, with its signature orange cranelike bots a fixture in automated car factories across the globe. In the space of a few months (from October 2018 to January 2019) Kuka has needed to 're-adjust the Guidance' on revenues and EBIT margin. Things can continue, until they can't. China has followed the Western economic model of borrowing its way to prosperity. As we've seen with all previous busts, there's always a point where debt limits are reached - even for China - and then suddenly the market reacts. With or without trade wars, China is going to hit a wall. It simply has too much unproductive debt...propping up a giant property Ponzi scheme. When the proverbial hits the fan in China, you can be assured it's going to be flung across every other nation...especially Australia. Those who think they're smart enough to get out just before this happens are deluding themselves. The ride down can be so swift and sudden, you'll not know what hit you. Please note: This article was first published in Markets & Money on 21st January 2019. We request your view! 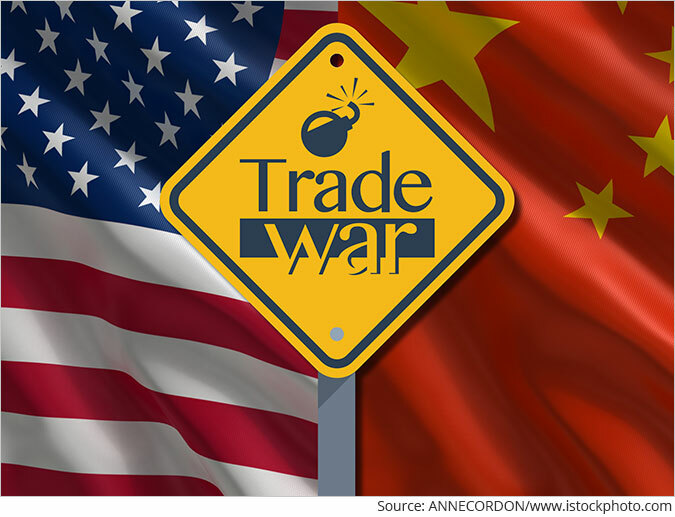 Post a comment on "With or Without Trade Wars, China is Going to Hit a Wall". Thank you for posting your view!